Do you like circus? Many since childhood have not visited this amazing place full of mysteries and secrets. The special world of the circus invites you to discover the most profitable corners of it! Betsoft Gaming invites you to go to the most mysterious place in the world – to the store of magical circus paraphernalia together with the new slot machine The Magic Shoppe. Players will have the opportunity to touch real magic in a five-reel slot with 25 prize lines, free spins, risk-game and bonus features. 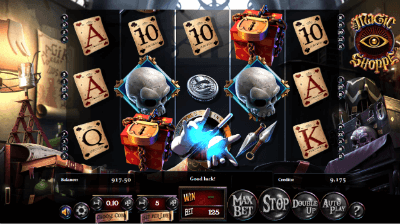 Magician cards, magic cylinder, silver coin, throwing knives, handcuffs and a magic skull painted with runes are simple symbols constantly rotating on the screen and making up winning combinations. The game offers other bonuses to its fans. gloves of the magician with a magic wand is a symbol of Bonus. When three or more such images are gathered on the game board, magic is to be turned on and turns all the special characters on the screen into Wild. Blue and red chests can bring from three to twelve free spins. If the player collects three red chests, he or she will have a fantastic chance to run Sun Free Spins 3 times, four chests – 6 times, five – 12 times. Similarly, the symbol of the blue chest works, only a round of free spin is called Moon Free Spins. During free launches, almost every spin brings payouts. If you have not yet lost faith in magic, then the new slot machine The Magic Shoppe is exactly what you should definitely try. High-quality 3D graphics with a clear drawing of details, memorable special effects and incredibly addictive gameplay are guaranteed.